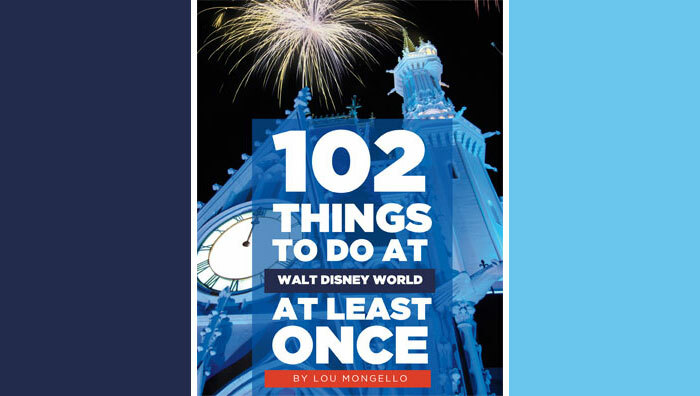 *I must preface this entire blog by saying that we were assisting Lou during the D23 Expo and were able to gain early entrance directly onto the showfloor prior to the general public’s admittance. My opinions would have been greatly different if I had waited to enter with the D23 Gold and Silver members. I always like to start with the bad news, but The Ugly, The Bad, and The Good just doesn’t sound correct. 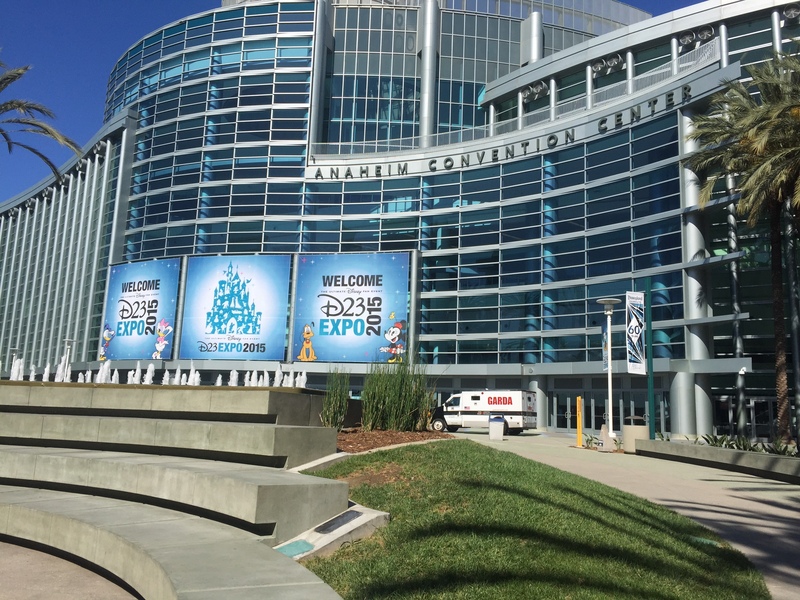 So, let’s start out with the good and well designed areas of the 2015 D23 Expo! This shop, although small, was the best managed and effectively got people through the store quickly without feeling rushed. If you are unfamiliar with this store, it is an Imagineer/Disney Cast Member exclusive store that is only found on the grounds of the Walt Disney Studios in Burbank (Unless you attend the D23 Expo or Destination D events). 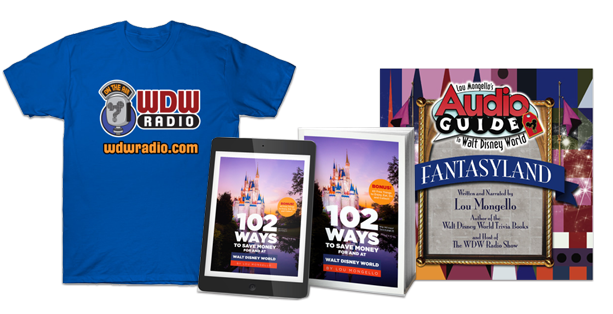 There are collector pin sets available nowhere else, Disney Imagineering branded apparel, and lots of office products available for the uber-Disney fans to purchase. First thing on Saturday morning, we made our way over to this store, while the lines were short, to get our shopping done early. Often times there were lines, but the wait was mainly in the hour long range (much shorter than its sister Disney Store). The one and only complaint I had about this store was there was very little room for our stroller to move around (although stroller-pushers probably accounted for only 5% of the Expo attendees), and I also observed several ECV users also having issues with maneuvering through the store floor as well. New to the 2015 Expo was the family area located on the second floor of the convention center. 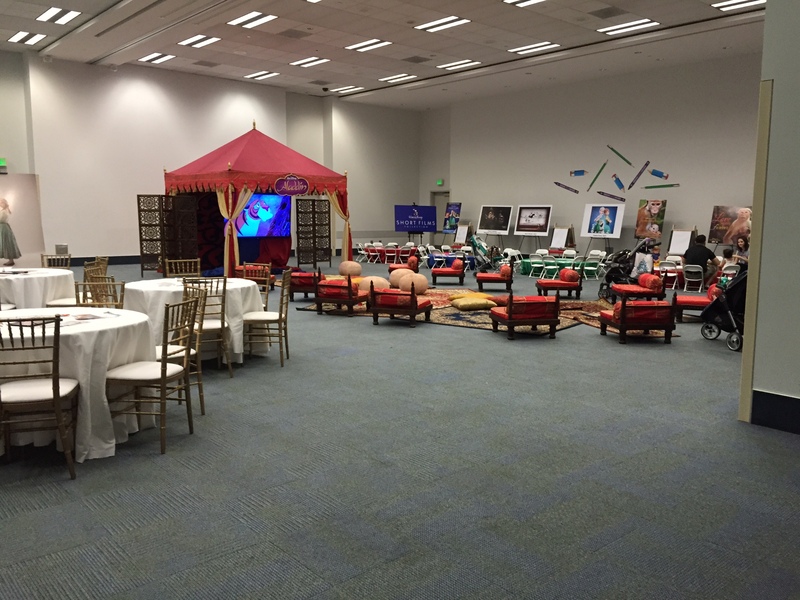 This area featured kid-sized tables with coloring activities, tables for adults to relax, and also an Arabian-decorated area showing Aladdin for the children to sit and watch. We really enjoyed going to this area to let Walt crawl around and play with other toddlers instead of making him sit in his stroller and be miserable (Note: 10 month olds who have discovered crawling do not enjoy not being allowed to roam freely like they can at home). Due to the theming of the room, there were thick rugs in the area where the movie was showing, so I was never worried about Walt being hurt by falling over. I will say that on Saturday morning they did have auditions for females to sing “A Whole New World” on the Center Stage later in the day, and they decided the children would be okay with being quiet and listening to 50 girls sing a 30 second clip of the song over, and over, and over again. Maybe next time they will move this audition to a new location so that parents don’t have to go crazy from hearing the song over and over (It could be worse, I guess. The girls could have been singing “Let It Go” as we have often been hearing in public). But, overall the room was a wonderful addition to the Expo! Disney announced they were going to expand on their StagePass add-on from last time and offer StorePass for their three largest Disney shopping venues at the Expo: Mickey’s of Glendale, the Disney Dream Store, and the Disney Store. Fans were excited and ready to use this new shopping tool to save some time during the weekend, but along with the good use and concept, comes the bad. First, the line to obtain a ShopPass was often a two-hour wait (equal to or longer than some of the actual store lines); second, they only offered 150-175 passes to each store; and third, for each Expo ticket (no matter how many one single person held while in line) the person could obtain one ticket to EACH store. For example, if one person standing line held 3 Expo tickets, they could walk away with 9 StorePasses! I don’t believe it is fair that one person could stand in line for three separate people, especially since the Cast Members were counting attendees in the line and cutting them off after a certain number (like the 150-175 number to correspond to the passes they had to distribute); if several people in the line were obtaining more than one guest’s passes, that number would be completely off. But one other downside of the distribution rules was that one guest could walk away with multiple passes for each ticket. They should have been walking away with one, and only one, StorePass at a time, to allow other Expo attendees the opportunity to gain one as well. Even of they were not able to get a pass to the Disney Store, a guest should have still been able to visit Mickey’s of Glendale without waiting in line! As mentioned above, we were on the show floor early and did not have to worry about arriving at the Anaheim Convention Center early to stand in line for entry, but I did travel to the end of the line on Friday morning and can attest that it was chaos. They had marked out two separate lines: one for D23 Gold and Silver members (who were allowed to enter at 9am, one hour before the general public) and the second for general public. Sounds simple and easy, but it did not turn out that way. From conversations, we heard that it took some Gold and Silver members over two hours to get into the convention center and onto the show floor. The main entry lines were not taking into account the people who were standing in a separate line for the first major stadium presentation (a room that held about 7,500 people). Another part of the process that took time was the distribution of the Expo guide books and bags right inside the convention doors. This did slow the entry process down. Even though they wanted to distribute the items to the guests, it took time out of the experience for the day. Free activities at Disney usually have a habit of turning into an absolute mess, which we Disney fans somehow don’t expect! This is exactly what happened with the Disney Visa trading card activity during the Expo weekend. You were given a free pack of trading cards with your Expo guide at the front door (One reason some people wanted to make sure they received the guide I’m sure!) and then were able to collect other cards during the weekend at various distribution spots. Disney released the location of said spots through their D23 Expo App and social media. When fans got word of new card releases, it was like Black Friday shopping with people running to pick up one of the trading cards for their collections. Disney Visa had also set up a booth where you could typically gather more cards and also trade with other fans for those missing from your collection, which contained 30 card styles in total. What was unexpected was the release of the final two cards and the absolute mayhem at the Disney Visa booth on Saturday afternoon when collections were not completed. Just like the Pixar balls (an entirely different story), they were giving out for free, and they both ended up up eBay before the end of the day for crazy amounts of money. Speaking of shopping, the worst of the worst was obvious each day when the line and shopping began at the Disney Store. As soon as the show floor opened, hundreds of fans began running to the queue of this store to wait for 2-3 hours before they were actually allowed into the store to shop. While there were hundreds of people queued and waiting to make purchases, other guests were purchasing every item they were allowed to (per the Disney rule each guest could purchase two of each style of merchandise) even if they were items they had no interest in. And of course, as soon as they had them in hand, they were listed on eBay to be sold for triple the price. This was mainly true for the daily collector dolls and the Disney Tsum Tsum plushes released. I was able to gain a StorePass for early afternoon on Sunday. They were selling the Steamboat Mickey and Minnie Tsums, and I wanted to add them to my collection. My pass was for noon, only three hours after the store had officially opened. However they were already sold out of the Steamboat Mickey plushes and only had the mini-tsum of Minnie remaining. I was able to find a Cast Member who had two remaining Steamboat Mickey tsums and was more than happy to let me have them. It was very sad knowing that people who actually wanted certain items for their collection were not able to purchase them because people ahead of them in line had bought items only to resell them for a profit. Overall the Expo was fun and we were able to meet people I have only read or heard about, we got to see new entertainment and attractions yet to come, and we also spent time with some wonderful friends! However, bringing a young child to the Expo is not something I care to experience again as the crowds, noise, and schedule completely overwhelmed him. As for attending the next Expo, which has not yet been announced, I think that we might sit the next one out as the weekend was not as exciting as one in Walt Disney World! We might just have to look into the Destination D events that usually take place in Walt Disney World because that would be a little less stressful and still just as exciting! Alyssa Wiseman (also known as ajwiseman09 in the box), her husband Brandon, and infant son, Walt, reside in central Indiana (too far from Disney). Alyssa and Brandon enjoy traveling to Walt Disney World several times a year to see what is new and enjoy classic Disney. While traveling, and at home, Alyssa is frequently shopping for Disney products and making a list of items to buy while in the parks. Please follow Alyssa on twitter @ajwiseman09. Perhaps they should offer a separate venue called E23 (as in eBay) exclusively for those *ahem* collectors that are merely there to participate in arbitrage. And for D23 attendees, they could then have a more fan specific event that isn’t marred by greed, and hand out opportunies for exclusive purchases from attending presentations, exploring exhibits, showing your “Disney Side” via cosplay, etc. There is certainly no fool proof way to prevent the bad and uglies when it comes to these events, but segregating those looking to make a quick buck without much care of lasting memories of the event or fuelling a passion, should not ruin for those left with little to show for their fandom. Maybe in a couple years, there will be a change that will reward the patient and engaged with physical perks not available to those sprinting to the stores with dollar signs in their eyes. I would have liked to get the Once Upon a time dolls as a fan of the show but the handling of this was done so badly. On Thursday they limited Sorcerers to 50 dolls but then on Friday released another 100 that also went to Sorcerers quite a few were on ebay at a huge price hike they cost $130 were at $2000 this made it even harder for the average collector when asking a cast member about the way they were distributed the reply was we listened to complaints and have decided to split the merchandise over a few days to give more people a chance to purchase when I mentioned that this plan can’t work as the same greedy people get them on the first in first served basis the reply was oh we didn’t think about that. I was lucky to get the HO 40 x 27 inch Star Wars poster on Sunday which also has been sold on ebay by a few at prices from $500 to $1000. D23 had some good moments but I came from Australia and have never seen a badly organized operation of trying to get people into the building and I’m someone who was in early.